The transition from paediatric to adult care for young people living with IBD is ideally a staged process where young adults are gradually integrated into adult care. Viewing this transition as only an isolated ‘event’ can mean that young people reach adult services not possessing the skills required to self-manage their condition, and run the risk of drop-out or health-negating non-adherence. Practical skills such as booking tests through to lifestyle skills such as managing diet and activity levels are also called upon, as well as navigating health-risky behaviours such as alcohol consumption, smoking and sexual activity. This level of self-management is underpinned by the process of adolescence itself, where identities are being formed, cognitive and social skills are developing, and a gradual shift to independence from key caregivers is taking place. Currently there is no official or consistent process through which young adults with IBD in New Zealand transition from paediatric to adult services. It is understood that most clinicians recognise there is a need in the community for a more structured and inclusive process, but what this might look like is not yet bedded down. Over the last two years CCNZ and Pharmaco NZ Ltd have worked with Atlantis Healthcare to develop an approach that addresses this major clinical gap. We believe the project uncovered the optimal transition process for young people living with IBD in New Zealand to progress from paediatric to adult care. In 2016 CCNZ put together a project team that comprised of a select group of specialists who are actively involved with providing and supporting the care of teenagers through the transition phase from adolescent to adult services, to assist in the development of a new website. Interviews were held with key stakeholders – including Gastroenterologists, IBD Nurses specialists, a clinical Phycologist, and young people living with IBD who have recently transitioned from paediatric to adult care. A draft “optimal transition” pathway was generated and used as a blueprint for assisting young people with this transition. The end result has been then launching of a website, ‘IBDandMe’. The objective of this site is to empower teens and parents of young children with IBD to effectively manage their disease. ‘IBDandMe’ is a resource portal with tips, videos and information to prepare and assist patients’ transition from paediatric to adult care. CCNZ felt an IBD Transition Website was crucial – with age appropriate information, however the key to making a difference was creating a community and soon to follow will be an interactive online chat forum, which will help create that community. 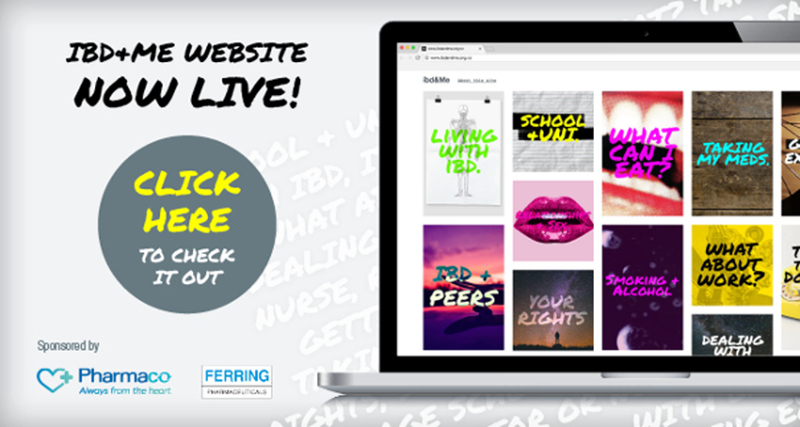 CCNZ, together with Pharmaco NZ Ltd are proud to bring you New Zealand’s first IBD Transition Website, ‘IBDandMe’.